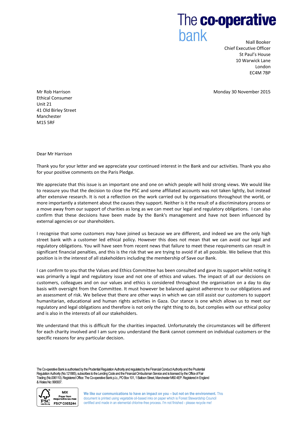 Niall Booker, CEO of the Co-operative Bank has responded to our open letter. Thank you for your letter and we appreciate your continued interest in the Bank and our activities. Thank you also for your positive comments on the Paris Pledge. We appreciate that this issue is an important one and one on which people will hold strong views. 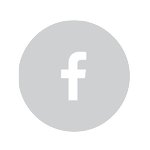 We would like to reassure you that the decision to close the PSC and some affiliated accounts was not taken lightly, but instead after extensive research. It is not a reflection on the work carried out by organisations throughout the world, or more importantly a statement about the causes they support. Neither is it the result of a discriminatory process or a move away from our support of charities as long as we can meet our legal and regulatory obligations. I can also confirm that these decisions have been made by the Bank's management and have not been influenced by external agencies or our shareholders. I recognise that some customers may have joined us because we are different, and indeed we are the only high street bank with a customer led ethical policy. However this does not mean that we can avoid our legal and regulatory obligations. You will have seen from recent news that failure to meet these requirements can result in significant financial penalties, and this is the risk that we are trying to avoid if at all possible. We believe that this position is in the interest of all stakeholders including the membership of Save our Bank. I can confirm to you that the Values and Ethics Committee has been consulted and gave its support whilst noting it was primarily a legal and regulatory issue and not one of ethics and values. The impact of all our decisions on customers, colleagues and on our values and ethics is considered throughout the organisation on a day to day basis with oversight from the Committee. It must however be balanced against adherence to our obligations and an assessment of risk. We believe that there are other ways in which we can still assist our customers to support humanitarian, educational and human rights activities in Gaza. Our stance is one which allows us to meet our regulatory and legal obligations and therefore is not only the right thing to do, but complies with our ethical policy and is also in the interests of all our stakeholders. We understand that this is difficult for the charities impacted. Unfortunately the circumstances will be different for each charity involved and I am sure you understand the Bank cannot comment on individual customers or the specific reasons for any particular decision. There will inevitably be some charities for whom we are unable to maintain accounts. We are however open to any representations they may make and are happy to explore other avenues by which laudable humanitarian, educational and human rights activities can be undertaken, most likely via established, registered charities with robust processes in place.